An arctic cold front came to our part of Texas this last weekend. It brought temperatures down to the teens in some parts. As a Texas girl who loves hot summers and warm spring and fall, winter is truly the time of year I feel like just hunkering down to let it pass. Those who know me will attest to the fact that I am a "cold weather wimp". Even though I grew up in some pretty cold areas of the world, I have grown accustomed to the heat of the south, and I love it! Thankfully here in the Texas Hill Country we only see a few weeks of the season get this stinkin' cold, and this last week was one of them and came a little early too. So I piled on my layers of clothing, raided my cold-weather-junkie-husband's winter clothing for extra protection from biting wind, and dredged out to feed the herd three times a day. This herd must feel the same way I do about the cold weather, they were a bit grumpy about it too! They also tend to hunker down, and get sedative through the day, sticking close to the hay barn for wind break and probably the hope of extra hay, which I always give them to keep them warm when it gets this cold. I can only let them do that for so long though. Horses were made with very complex digestive tracts, and when they don't get moving physically they can get in some trouble. See, they are grazing animals with about 70 feet of intestines wound up inside their body cavity. So it is pretty important that they physically move a lot during the day and night. My strategy to keep them moving during this recent cold front was to wheelbarrow their hay out to their 15 acre pasture, putting small piles of hay all over to make them do a lot of walking. Even though it meant more time feeding in the dreaded cold and biting wind, that is a whole lot better than having to walk a horse for hours with colic in the cold and biting wind. As I was walking across the pasture several times today I was thinking about how we too get "stuck at the hay barn" at times in our lives. You know that comfy place that blocks the cold wind of our circumstances. It can also be called complacent. Stuck. Denial. Unfocused. Distracted. To name a few. It happens in our marriages, our work, our parenting, and yes even our horsemanship. Sometimes our circumstances really do make us want to hunker down til the storm passes. But is that what God calls us to do? And aren't we too, like our horses, made in a way that needs movement? I find that we are. We are made to need movement towards God. Especially in those storms of life . No matter how big or small they are, that is what He tells us, and that is what He sent His son Jesus to do, to make a pathway for us towards relationship with Him. So what do we do to get moving again? For me, it came in confession today. Confession of my fears to Jesus, because He indeed asks me ifor them. Fear of not always knowing what my children need as they change and grow up faster than I ever could have thought possible. Yesterday in church my husband and I watched a tender moment between a 4 year old little boy and his daddy sitting in the pew in front of us. His father held him in his arms while he sang worship songs, and the little boy had his arms wrapped around his daddy's neck with his little hands clasped together, finding every bit of comfort he was needing that moment safe in his daddy's arms. I thought about my own children at that age and how much easier it was to know what they needed then, now as teens and tweens they seem to be a little more complicated. I confessed my worry of not knowing how to be the best wife possible, and even more the worry of how to be the woman God wants me to be, instead of the one the world tells me to be. And there I was getting unstuck from the hay barn of my circumstances today. One by one I put them in the wheelbarrow to Jesus and wheeled them across the pasture. And one by one He reminded me that He is with me in all of them, and will provide me every day with what I need to keep moving. It is a gift to care for a herd of horses every day (in the cold too), but it is more of a gift to have my soul be cared for by my loving Savior, Jesus. Are you "stuck at the hay barn" today? What are your circumstances that need to go into the wheelbarrow to Jesus to get you moving again? "Therefore, since we are surrounded by witnesses, let us throw off everything that hinders and the sin that so easily entangles, and let us run with perseverance the race marked out for us. Let us fix our eyes on Jesus, the author and perfecter of our faith, who for the joy set before him endured the cross, scorning its shame, and sat down at the right hand of the throne of God. Consider Him who endured such opposition from sinful men, so that you will not grow weary and lose heart." We horse chicks know about pressure and release. It is how our horses learn. 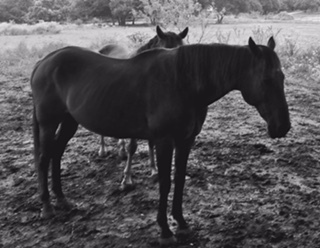 When interacting with horses we are constantly applying pressure and releasing pressure. To begin with, just being a predator and trying to communicate with a prey animal is pressure for them. We can at any time in the presence of horses take a step back and see how pressure is being applied and released. We are either carefully aware, or unaware, of how it is affecting our horse in our process to create trust and partnership. Pressure comes in many forms and one could, and several have, written pages about it. Today God has me thinking about pressure and how it relates to my walk with Him. So about the pressure we as humans experience. I have been experiencing some anxiety off and on for the last couple of days over an upcoming event in my life. It is nothing new for me, just the "thorn in my side"/adversity that God is using to grow my faith in profound ways. As always the anxiety comes from one of the old lies that the enemy loves to use against me. I say "old lies" because at one time I believed those lies. But not today. I have walked through those dark places with Jesus, and He has delivered me from them. Praise the Lord! But the enemy knows that even still today there is residue of those lies in my heart and mind, and he takes full advantage of my weak moments. As always Jesus faithfully delivers me from each attack, every single time. Today, in wake of one of those attacks I have been chewing on how the pressure of those lies makes us turn our thoughts inward. There is a pattern in humans to always focus on the negative, there is even research that shows how the brain is wired to remember negative events more than positive. Just like our horses' brains are wired as prey animals to push against pressure and we have to teach them to give to pressure. When we teach a horse about giving to pressure, it is in the release that the horse learns. When the horse stops pushing towards the pressure and gives to the pressure of our gentle touch it can be a moment of complete learning if we release the pressure at just the right time. Our tendency, just like the horse, is to push back against those pressures we are experiencing. And as the imperfect sinful people that we are wired to be, we tend to direct that pressure inward towards ourselves. Often we do this by playing old tapes of those lies, or current ones, we listen to what others are saying, or we become so focused on trying to bend that pressure to our own will that we forget, or do not know, that God is calling us to give that pressure to HIM. But you may ask, as many a horse chicks have done before us....how do I give to the pressure? Just like our horses' brains are wired to be on constant alert, so are we. God's Word tells us to be "self-controlled and alert, that the enemy prowls around like a roaring lion looking for someone to devour." I actually think God just right there told us to be like a horse! First, be alert...be aware of when you begin to feel those physical sensations of the pressure, just like you notice them in your horse. The next step, be self controlled. Just like when your horse is triggered and ready to go into fight or flight mode, you ask them to go back to the foundation you taught, and focus on your cues. God is asking the same from you....turn your focus away from yourself, and focus on Him, praising Him as your savior and telling him how much you love Him. The next step, submit your repentance to Him. Here is a very important thing to know about the enemy you are to be alert for...he has a nickname, it is "the accuser". His goal is to beat you to God and tell on you and bring forth shame on you. So learn to be faster, and wiser, and beat the enemy to it by quickly, in prayer, asking for forgiveness for your doubt, your worry, your fear, your self-reliance, your sins. And then look to God, and in humble prayer ask for help from our Lord, our Heavenly Father. And then find rest in the release of the pressure that comes from turning to Him as our refuge. 1. Identify the pressures you are experiencing. Physical or mental. 2. How are you inwardly focusing from them? 3. Make purposeful time today to release that pressure to God using the steps listed above. 4. Just like our horses learn from consistency, so do we. Be purposeful and consistent in spending time with God, in humble prayer and plea for His compassionate help. Luke 12: 22-31 "Do Not Worry"
Ephesians 6: 10-17 "The Armor of God"
We horse chicks know all about a thing called "Herd Bound" or "Separation Anxiety". 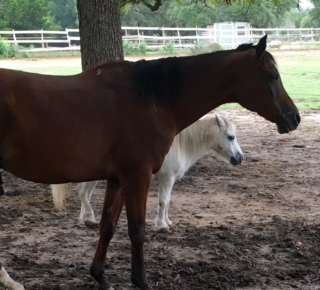 Yes, sometimes we horse chicks also experience this when away from our horses, but I am writing here about what some horses experience when they have to be separated from their herd. This is common in the world of horses because horses are herd animals and they all experience this on some level whenever they are separated from their herd. It is how God designed them, and serves a very important purpose. They are designed to need their herd for safety from predators. "Safety in numbers!" But what about how God designed us? In the perfection of His plan, He designed us to need also. To need dependence on another. I can honestly say that all of us at some time in our lives have focused that need of dependence on someone or something other than God. 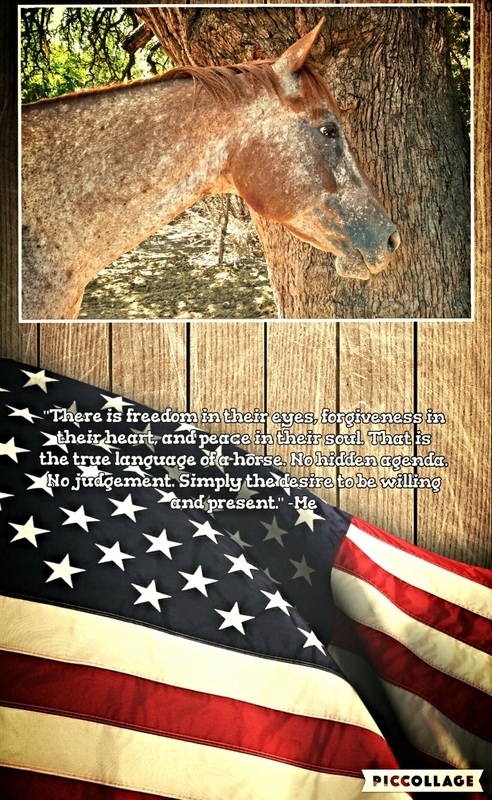 Just like our horses were made to need their herd, we were made by God to need Him....to need His love, His direction, His compassion, His comfort, His strength, His provisions....the list goes on and on. Yet we so often replace that dependence that was meant first and foremost for Him, with self-sufficiency, personal saviors in our loved ones, money, success, addictions, work...and again that list could go on. When I have a horse that is "herd bound" or experiences anxiety when separated from its herd there is training to be done specifically for that. That training always begins with our relationship of trust between each other. I keep in mind though that my relationship with my horse will never be as safe as his relationship to his herd. 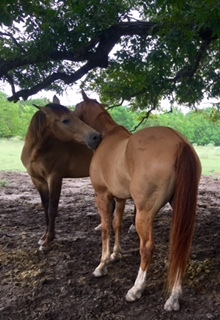 I can, over time with my horse, build enough trust that he can feel safe to leave his herd and go where I lead him, but I know his complete and wholehearted trust and dependence remains with his herd of horses; as it should. We are just like the horse...we can build trusting attachments to our loved ones, dependence on our professions, belief in things we "depend" on, but in the end the dependence we most seek can only be filled by relationship with God our Heavenly Father. What are you depending on that is taking the place that God seeks to fill in your life? Are you training yourself to spend daily time with God, so as to build that trust with your one true "herd"? "I have loved you with an everlasting love; I have drawn you with loving kindness." "My sheep listen to my voice; I know them and they follow me." It is interesting to me how the horse's purpose in our world has changed over the years. Once used mainly for work and transportation, in our civilization today their purpose is quite different, instead fulfilling the needs of people in the ways of relationship, hobby, sport, and even therapy. Several of the horses at Tyson's Corners have ended up here because of a very common situation in the world of horses. A change in their purpose. More often than not it seems that our biggest problem in working with horses is that we don't share their mind or buy into their true purpose. Other mentalities capture us, and we expect them to fit into our perceived purposes. We create a box unto which to fit them into. And then when we cannot fit them into that box any longer we become overwhelmed with the results we created by trying to put them into that box. The box could be dreams or goals, but for certain that box will change as we accept our own realities, as well as the reality of our horse. Most of my days consist of working these horses who got off a path and somehow found their way to Tyson's Corners for refuge or a fresh start, out of the box they had once or even many times been put into. Their lesson plans consist of the same things....trusting again, maybe finding the ability to relax in the hands of a human again, or even for the first time. Everyday as I stand in the middle of the round pen at the end of a 22 foot long line, and ask them to just breathe, slow down, connect with me, trust the feel of my energy, my hands on the rope that connects them to me, I think about God. I ask the horses to yield to my touch on the rope, to the sound of my voice, the change in my body, to my care and love for them and their purpose. As I ask this of my horse so does God ask this of me...and oh how He thankfully does it with so much more patience, mercy, and grace for me. He also asks me to look at His horses with eyes of reality, what they are bred to do, what their temperament is suited for, what their own life experiences have conditioned them to do. Because that is their reality, and therefore must be mine as well. Realities can at times be extremely hard. Whether they are realities of our selves, of loved ones in our lives, the state of our relationships, finances, professions, or even our horse, they are not always easy to face. Throughout the Bible we read stories of real people facing real and very difficult realities. We also read the words of God telling them and us, "Do not fear...slow down...connect to Me...listen for My voice...trust My hands at the end of this rope with you...you are where you are because this is part of your reality and your purpose. Have Faith." What is the box in your life? The mentality you are believing in? What is the reality God is leading you into or holding space in with you? Are you giving Him your faith in His ability to be at the end of the rope with you? "But my eyes are fixed on You, O Sovereign Lord; In You I take refuge..."
For more encouragement read Psalm 139. 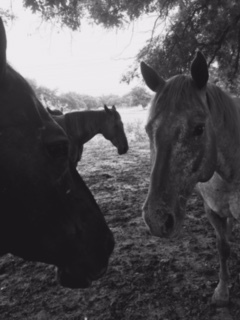 Guest Blog post by fellow Horse Chick and friend, Rachel Loscomb, a woman who loves God and horses too. 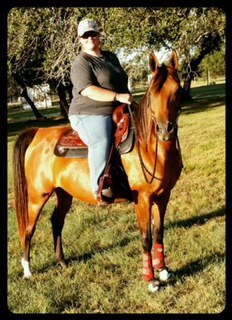 It is with great esteem I welcome her to the ranch to share how God works in her life through her horse Ahmbi. 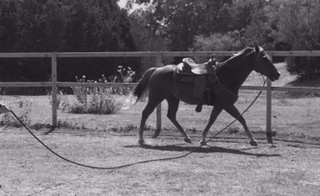 One of the greatest ways that I've found to exercise my mare is by long lining. This seemingly observable "easy" technique can quickly turn into a tangled ball of rope and horse if you aren't paying attention! The long lines serve as extendable reins, a direct connection of my hands. When my mare and I first started this journey, I had no idea the implications it would have on both of us. Now Ahmbi has the type of personality where she is never overly excited to work and tries every trick in the book to find a short cut to the exercise she is asked to do. The classic "mare face" is unleashed when the time comes to work! However, once she understands the task I'm asking of her she gives it her whole heart. Often at times when I'm working with her I often think of the situations that I've tried to find life's short cuts or faster ways around what was happening in my life. Ducking, weaving, evading-all common themes I saw in my mare at first that I've found my own self perfecting for most if my life. Why work harder when you can evade? Run away? As the months have gone on, I've noticed that as I learn to convey the right amount of pressure paired with releasing at the right time, Ahmbi's learned that her evasion techniques can't work in our partnership. Now, this doesn't mean she doesn't try and I have to always be that one...or two steps ahead of her! This is how we often approach our lives with God. We duck, dodge, weave around His plans in hopes that He didn't see that latest defensive tactic because it makes us feel uncomfortable or it doesn't jive with what we hoped our lives would look like. Sometimes we get in a pattern of living like this that we instinctively hit the repeat button and try it again...over and over again. But just as I have learned to be patient with Ahmbi to teach her, I realize that we are both teaching one another! Stability, trust, genuine love...all core components of a working team! The long lines serve as an overreaching extension of the trust and respect we share, which can be a positive or negative experience depending on the hands holding the reins! God wants us to approach with a willing attitude and not one of resistance and contempt. Most of the time this is easier said than done and it's something that I constantly fight with. A futile fight that God ends up winning. Every time. I've learned over the last few years that you don't train a horse, you don't break a horse. You come into partnership with your horse, you teach one another, you allow one another to enter each other's lives. Ahmbi is an incredible teacher and I am truly blessed each day to have such an incredible gift from God. She's showed me how to love, play, and trust. Most importantly, to be in the present, showing me the person God has always intended me to be.